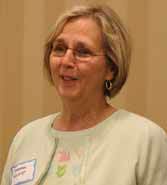 Our good friend and advocate, Barbara Mackey, retired from our board in Spring, 2006 after years of loyal service. The Friends honored Barbara at our Annual Meeting on June 11, 2007, and presented her with a book on shorelines as a thank you token for her many years of hard work and steadfast support of Hall’s Pond. Barbara’s leadership of the Friends from 1996 to 2006 was most notable for the development of a master plan and the restoration of Hall’s Pond and Amory Woods. This undertaking was supported by a foundation grant from the Stoneman family in conjunction with the Town of Brookline. Now as we all enter the gardens and the sanctuary, with the birds and the boardwalks and lush vegetation, we can well appreciate the results of years of effort and planning which, under Barbara’s inspiration, came together so beautifully. Barbara has since relocated from Brookline to the Charlestown waterfront, where she now enjoys boating in her spare time. The meeting also featured a presentation on global warming by Matthew Alvarado, research assistant at the MIT Center for Global Change Science. The audience appreciated Matthew’s thoughtful and concise talk on what global warming might mean to our community. Following a question and answer session, resource information was distributed. One particular reference that might be of interest is from the Union of Concerned Scientists, “Climate Change and U.S. Northeast” (www.ucsusa.org/news/press_release/global-warming- will-alter.html). Matt is also a Town Meeting Member in Precinct 3, a board member of Brookline Greenspace Alliance and a past volunteer of Hall’s Pond Community Work Days. Reports on the maintenance of the sanctuary, membership activity, newsletter, and finances of the Friends of Hall’s Pond were also given during the meeting. Board nominations and re-elections were held and three new board members were elected. Mary Harris joined as board member and secretary; and two students, Amy Harmsworth- Morrissey and Saba Mostafavi joined as Brookline High School representatives. A reception followed the conclusion of the meeting. The Board welcomes your suggestions for award recipients, topics for future annual meetings, and content ideas for future newsletters.